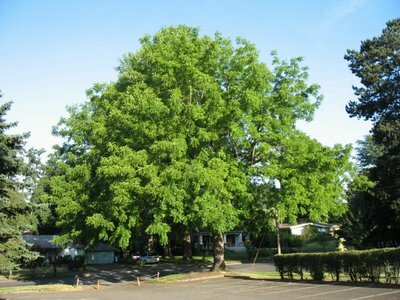 Eastern black walnut trees (Juglans nigra) are notorious killers of plants. Their roots release a toxin called Juglone. Blueberries and azaleas are a couple of the plants that will die slowly if planted closer than eight feet outside the walnuts spread; a spread which can be as much as 60 feet from the trunk of a very large tree. Juglone is a growth preventer (‘Allelopathy’) exuded by the walnut tree’s roots. Falling leaves and nuts contribute to the soil contamination, but the roots are the biggest offenders. Even if the tree is removed, the roots often remain underground and will actively release the juglone for years. If the roots are removed, it still might take a year before all of the juglone is out of the soil. That is why a spot where a walnut tree no longer stands can still kill newly planted shrubs or vegetables. Symptoms of juglone poisoning, which occurs to plants via their roots, can be anything from slow growth to wilted, yellowing or deformed leaves. They might just up and die for no apparent reason at all. Other susceptible trees in the area might grow alongside a walnut tree for years, until they grow large enough that their roots invade the walnut tree’s root area. Then, almost overnight it can seem, the interloper weakens and dies. Apple, birch, larch, linden, and many pines as well as black adder, saucer magnolia, and silver maple trees are the most susceptible to juglone poisoning. The juglone restricts the plants from taking up food and water, essentially starving them to death and/or drying them out. Even wood chips or sawdust from the tree, after it is felled, can stop or slow other plants’ growing ability. You should not use black walnut sawdust or wood chips as mulch. It will have the same killing effect on susceptible plants as it does when alive. It will lessen in time if thoroughly composted. It would be best not to use walnut wood chips or sawdust on garden paths, either, even though a case could be made for keeping the pathways clear with juglone mulch. It is possible, though, that it might travel into the surrounding planting beds. Once infected, there is no way to save these ailing trees, shrubs, vegetables and flowers. The only way to “fix” the soil is to remove the tree and its roots. If this is not feasible, and you want to grow some bloomers near a black walnut tree or in an area where one once stood, some resistant annuals include begonias (fibrous rooted), calendulas and pansies. Perennial daylilies, hostas and some wildflowers, like bloodroot, are also resistant to the juglone. Resistant shrubs include spiraea, daphne, and rose-of-Sharon (Hibiscus syriacus). For a large listing of shrubs and trees resistant to juglone, visit the Morton Arboretum website.